Maya's Happy Place: Is Extra-Virgin Olive Oil Safe For People With Severe Food Allergies? Is Extra-Virgin Olive Oil Safe For People With Severe Food Allergies? 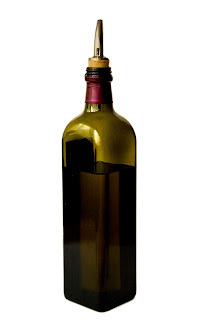 Is your olive oil really soybean oil and chlorophyll? I went on to find this message board on Chowhound which touches the surface of this matter. I was absolutely livid. With all of the Food-Allergy Labeling that goes on, how are companies ALLOWED to get away with this? Simple. They either don't know their supplier is lying or they submitted to the testing process, failed and don't care to change their supplier! Studies show that over 50% of the imported Extra-Virgin Olive Oil failed USDA quality and authenticity tests as well as IOC chemical tests. You can read results for "Extra-Virgin Olive Oil Sold in California" as well as "Olive Oil Sold to Restaurants and Foodservice" separately if you click on either of the first two links on this page. Most restaurants don't even know their olive oil is fake. Luciano Sclafani blew the whistle on a particular olive oil when he noticed the company sold triple the amount of his own brand's extra-virgin olive oil at a fraction of the price. Connecticut Department of Consumer Protection Commissioner Jerry Farrell ordered food inspectors to test the suspicious product and the results will shock and rattle the entire food-allergy community. "We came across cans of olive oil that were for sale in Connecticut that had, after testing, these other oils in there — peanut oil, soy oil, hazelnut oil," Farrell says. Feel free to read the entire story here. Upon more research, I found out that "light" olive oil is the lowest quality olive oil out there and is more likely to be "mixed" with other oils than extra-virgin. Tom Mueller is the author of "Extra Virginity: The Sublime and Scandalous World of Olive Oil" which is the first book on my list of books to read. I did discover upon a Twitter search that he does have his own blog and lists which Extra-Virgin Olive Oils are pure. The bottom line to this post is no refrigerator test is foolproof and just because your olive oil solidifies does not mean it has not been tampered with or diluted even a small bit. For this reason, I will only trust the extra-virgin olive oils that Tom Mueller lists on his blog as pure or USDA Organic Extra-Virgin Olive Oils and you should, too. (I LOVE Kirkland Signature Organic Extra Virgin Olive Oil and use it for literally everything cooked that's not sweet ). In restaurants, eating anything cooked in olive oil is a risk for me, so instead of explaining this whole conspiracy and usually being looked at like I have four heads, I discreetly ask for olive oil and vinegar and discreetly pour a tiny bit into a bread plate. I then do a finger taste test; if it doesn't taste like olive oil to me, I don't chance it and opt for a steamed dish. Hopefully this post empowers your future food choices and helps you to avoid getting sick or feeding an allergen to someone you love! AAARRRGHH!! OK, this is so many things ... but not surprising. In fact, it may explain a whole lot. I go to every length possible to accomodate my 5-year old daughter's soy allergies AND gluten, egg, shellfish, and legume sensitivites ... but because of jerks like these olive oil cheaters, it's completely impossible to avoid soy! As you know, soy is in absolutely everything - and I understand a guy's gotta squeeze out an extra dollar by watering down someone's olive oil with some dirty stuff, but JUST LET ME KNOW GDIT!!!! Because of fools like these, I can't even tell if she's really allergic to any of the other stuff! No wonder her patches won't ever go away!!!!! I am so thankful for this website. It's the only time/place where I ever post any comment ... I check on it regularly to see what updates there are. I've saved Mueller's list to my phone and will go pick up an appropriate bottle TODAY. In the meantime, sorry for any negativity and please don't blackball me! Thank you again! my daughter's really severe eczema, where the patches are actually cut/blistering/etc., are under control now - by avoiding soy. But now she's got white patches of skin all over! Does anyone know anything about this?? Thanks! Believe me, I COMPLETELY understand your frustration and I got fuming mad when I found this out, too. I also felt redemption to know I wasn't crazy and my 'mysterious' reactions on some days now have the answer. I found out from a friend on Twitter that Costco sells the USDA Organic Kirkland Extra-Virgin Olive Oil. I bought two bottles because I use olive oil for so many recipes as well as in my salads. The white patches are a combination of scarring and repetitive use of corticosteroid creams/lotions. When corticosteroid creams are frequently used in the same areas on the skin or body, it halts melanin production in those areas. For this reason, many people with severe eczema reactions will develop 'white scars or white patches' in frequently scratched and treated (with corticosteroid cream) areas. Unfortunately, these are usually permanent, but CAN fade over time. One remedy I've heard of is rubbing freshly cut ginger and its juice on the area daily...supposedly this restimulates melanin production but it takes months or even years of doing it daily and it is not proven. That's too much work for me...I just wear the scars and avoid the sun and tanning since they show up more when the rest of me tans. I hope this helps your daughter...thank you so much for the positive feedback. It really means a lot to me to know my words are helping your daughter somehow! Thank you again for stopping by and commenting....don't ever apologize for saying how you feel. Its actually a brave and wonderful thing. Same situation. . .Child with soy allergy, eczema... Wondering what the heck else he is allergic to. And I echo Jean when I say this explains a lot! I am extremely grateful for the info. I'm happy you found this info and I hope he starts feeling better from now on! =) Thank you for stopping by! Unbelievable! Thank you for the information. My sons lips itch after eating chicken cooked in olive oil. He has a soy and peanut allergy as well. Sorry he had to experience that! And itchy lips are cumulative so mood swings and sleepiness are common 'minor' symptoms if no other signs. Make sure to check out the soy derivatives list I have on this blog...MANY things there which are soy ingredients not normally on food allergy websites. Hopefully with more awareness, things change soon! Thank you for reading and I hope he feels better soon! Unreal, this just makes me even more paranoid! Thank you for shedding some light and sharing some brands that are safe. My son and I are happy. Sorry for the delay, just saw this now. Its not easy but thanks to so many more companies fulfilling the demands of those who are aware, there are so many more on the market! Seeing that 'non-gmo verified' symbol is like a present of hope from the universe! So glad you found the info and I hope you and your sun are having an amazing week!